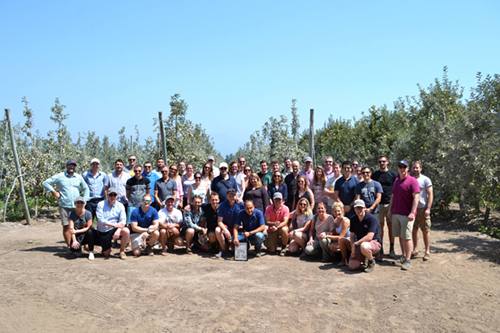 During mid-February I was fortunate enough to accompany 48 fruit growers and industry delegates on the Under 40s Fruit Growers Conference trip to Chile, which took in some memorable highlights of the country’s diverse fruit-growing sector. Agrovista is proud to be a Platinum Sponsor of the conference, a biennial event that aims to help develop the UK fruit sector by providing a forum for young growers to share knowledge and innovation and to give them a voice in the industry. It takes delegates to Europe and, as this year, occasionally beyond, to help them stay abreast of the latest technical and agronomic developments overseas and to provide an insight into how fruit growers manage their businesses and grow and market their produce. Chile was a fascinating destination, with many good visits organised by the committee. The days were very full, most with early breakfasts followed by two to three visits. During the week-long tour we visited various key organisations and companies involved in the fruit chain and, of course, some of Chile’s best fruit growers. Most top, soft and stone-fruit crops were covered, and the scale, expertise and efficiency of most operations in this country of climate extremes was something to behold. With my background in disease and pest management, I found the universal adoption of integrated pest management of particular interest, despite Chile having a much wider agrochemical armoury than we do here in the UK. This focus on IPM and targeted applications helps ensure Chile’s fruit, which is a key export for the country, is acceptable to the most discerning customers worldwide. Many of the delegates said they had picked up plenty of valuable take-home messages that they were keen to try back in the UK to help improve margins. Each day also included presentations by the main sponsors, enabling us to inform delegates more about our own businesses back in the UK, the services we offer and how they can help improve a fruit growing business’s bottom line. The visits helped us put into perspective our domestic growing and retail practices, the Chilean approach to fruit farming and retail and their methods of dealing with the challenges. As well as the obvious attraction of seeing a new country and how its fruit sector operates, the tour provided a great atmosphere for networking. Not surprisingly, given the packed itinerary, we often returned to our accommodation rather late, but that didn’t stop us making plenty of time for dinner, drinks and lots of conversation. As far as Agrovista is concerned, the tour provided an excellent opportunity to make new business contacts and reinforce existing relationships, in an informal atmosphere. It was very different and, in the nicest way, more rewarding than the traditional networking I would undertake at event likes the National Fruit Show or Fruit Focus. For the growers, the conference provided a unique opportunity beyond their usual confines to make new contacts and share their own knowledge, experiences and problems. Many growers, some of whom worked for themselves, others for farming companies, stay in touch with fellow delegates for years, forming mutually beneficial relationships that help them develop their businesses and career paths. I believe the opportunities afforded by the Conference are vital in helping the UK fruit sector develop. Young growers are the future, and those of us who rely on a thriving fruit industry have a responsibility to support them and help them develop rewarding careers. And that’s one very good reason why Agrovista is proud to be a Conference Platinum Sponsor.